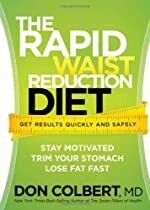 In The Rapid Waist Reduction Diet Physicin Don Colbert offers natural ways to shrink your waist and lose belly fat through diet, supplements, and exercise. Insights include ways to reduce your waistline, rid toxic belly fat. control weight, and stay motivated. In The Lean Belly Prescription Physicin Travis Stork offers a supereffective cure for belly fat. Straegies include the PICK 3 TO LEAN plan, 10-Second Slim Down tips, and the Laws of Leanness.